The 21st Ride for America will occur on Memorial Day, Monday May 27, 2019! The escorted ride will be from Loganville to Madison and Back. We are anticipating a very large crowd! Come help us honor and celebrate our nation’s fallen heroes. They are worth remembering! The video below gives some background about the ride and has some awesome shots about what it is like to ride. It is a ride worth remembering. RideforAmerica Vimeo from Beth Garrigal on Vimeo. What do your RFA dollars support? Your money supports the American Legion Legacy scholarship and many other programs in our community state and nation. We have sponsored Sea cadets to go to training, we have sponsored local little league teams to attend tournaments, and we have created a local scholarship for seniors in Walton and Gwinnett counties named for Cpl. 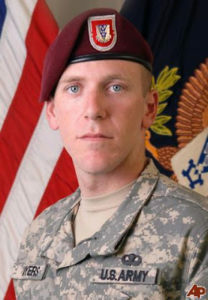 Jonathan Ayers (pictured above) of Snellville who was killed in Afghanistan in 2008. We currently have a 15 year endowment set aside for this annual scholarship. In addition to these scholarships, the monies we raise during Ride For America allow us to, among other things: visit with the heroes in the Georgia War Veteran’s Home twice a year and take them a nice lunch and goody bags of much needed items. We also donate, annually, to the Walk of Heroes. We appreciate every rider, every t-shirt sold, every pin, patch, an poker chip. Your money is going to great causes, large and small. Make a donation to Ride For America!